Posted on September 18, 2014 at 4:29 pm. 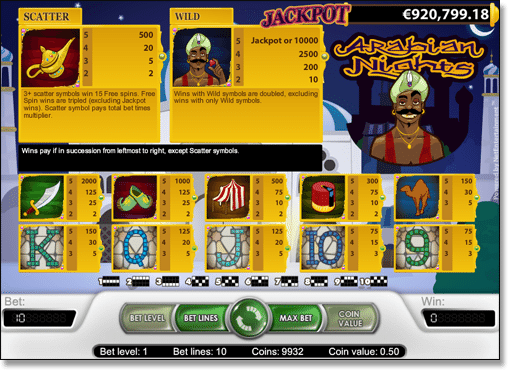 One of NetEntertainment’s most popular progressive pokie games – Arabian Nights – has a accumulative jackpot quickly closing in on one million Aussie dollars. 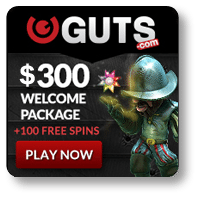 Play Arabian Nights for real money and in Australian currency at www.Guts.com or www.GdayCasino.com – two of NetEnt’s top online and mobile casinos. The game is based on the tales of “One Thousand and One Nights” – a collection of West and South Asian folk stories compiled in Arabic during the Islamic Golden Age, which included classic tales like “Ali Baba and the Forty Thieves” and “Aladdin’s Wonderful Lamp”. Set on a dry desert night, this pokie takes us back more than 1000 years, with tranquil Arabian music heard in the far distance. It is a five-reel, 10-payline game with a minimum and maximum betting limit of $0.50 and $5.00. In order to win the progressive jackpot, we need to bet the maximum across all 10 paylines – if the Arabic Prince symbol (the wild symbol) appears on each of the reels on any enabled payline, we instantly win the jackpot. If we choose not to wager the maximum and hit the same combination, we are still rewarded with $5000 – the second biggest prize in the game. Spinning three or more scatter symbols – the lamp – awards the player 15 free spins, with all wins during the free spins mode tripled. 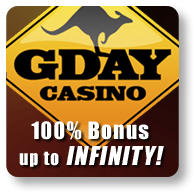 Free spins can be re-trigged within the feature an unlimited amount of times. The largest ever win on Arabian Nights was 4.8 million pounds (equivalent to 8.7 million Australian dollars), claimed by a man named Peter from Norway back in 2010 who hit five prince symbols across all five reels. The win shows just how big the jackpot can reach, so while it hasn’t quite climbed as high as $8,000,000 yet, one million bucks is no chicken feed. Guts Casino is licensed and regulated by the Lotteries and Gaming Authority of Malta, and G’day Casino is licensed and regulated by Curacao eGaming.